The Splined Single Speed Cogs from Surly breathe new life into Shimano / SRAM freehub wheels. They're machined from CroMoly and then heat treated and chrome plated for a durable, smooth finish. Tall tooth profiles help chain retention, and the 4.35 mm spline width better spreads out the load on the freehub body to avoid gouging. The wide base of the cog also means several sizes can be mounted together and then shifted between using a 9-speed derailleur and shifter. Sizes 17T and larger are drilled out to save weight. 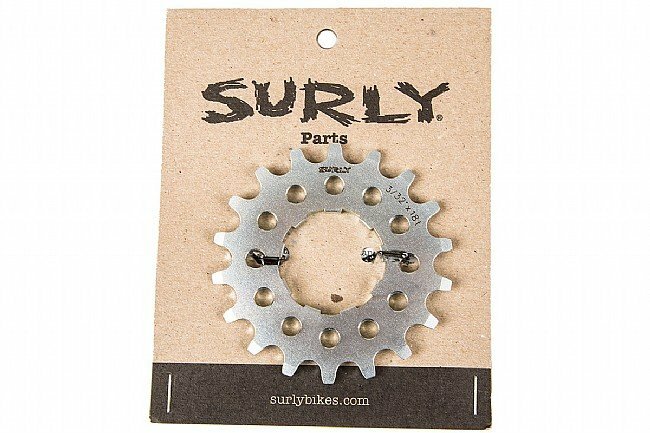 Compatible with 3 / 32" 6 - 9 speed chains, but Surly recommends the use of the narrower 8 or 9 speed chains. One of the best options(for price) for single speed cogs, these cogs have a large enough surface area which helps avoid eating into freehub bodies.